Marinate the prawns with chilly powder, turmeric powder, pepper powder and salt – longer time the better (minimum 30 minutes). Smash the green chillies finely with salt and the ginger garlic paste. Ideally use a pestle-mortar again. Close pan with a lid – keep on a small flame and allow to steam for about 7-10 minutes. Occasionally stir. When the prawns are reddish brown stained- they are ready. Add coconut about a minute before you remove from the flame. 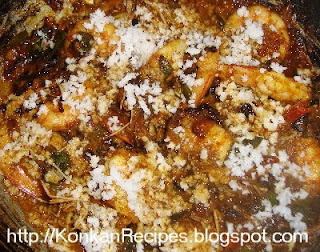 Enjoy as a side-dish with rice and some fish curry!